Transolution welcomes you to our website. We have been servicing vehicles for our customers in Missoula and the surrounding Missoula County area since 1986. Family-owned and operated, our team of technicians are automotive specialists striving to serve our customers in Missoula with honesty, expertise, and unequaled work ethics. These are the qualities that make ours the best auto repair shop in Missoula. From day one, our goal has been to build our company on a foundation of truth and honesty. We know that it is only the result of our customers that we have grown to the position we are at today, Missoula most trusted automotive service facility. When one finds an experienced technician that be can be trusted, that individual becomes an asset to a vehicle's overall performance. Additionally, having a great mechanic like those employed at Transolution will assist in preventing costly breakdowns and repairs. At Transolution, we develop routine maintenance plans for our customers' vehicles, plans that adhere to manufacturer's recommended service schedules and individual driving habits. Conveniently located at 4500 Transolution Lane, Transolution is a full-service automotive service center that performs factory scheduled maintenance on vehicles, oil changes, wheel alignments, tire rotations, brake inspections, suspension repair, car batteries, and even completely rebuilt transmissions. With decades of cumulative automotive service experience, Transolution is proud to be the ideal alternative to having a car repaired at a local dealership on Missoula. We stand behind our work with a warranty that is honored across the entire United States should there ever be a problem with a vehicle after being serviced at our repair shop. Transolution Auto Care Center invites you to take advantage of our easy 24/7 online scheduling! Simply complete and submit the appointment form to schedule your repair. Transolution Auto Care Center offers our customers in the Missoula area nationwide protection. Our warranties are among the best in the automotive repair industry. Transolution Auto Care Center is always interested in hearing from qualified individuals seeking employment at our Missoula automotive repair shop. If you are interested in joining the Transolution Auto Care Center team we want to hear from you. Transolution Auto Care Center is pleased to introduce our valued team of automotive repair & service specialists. Our staff is dedicated to ensuring our customers get only the best auto repair in Missoula, at the right cost, and to their complete satisfaction. Peg loves and enjoys interaction with customers and staff members. She's a really fun gal with a great sense of humor and openness to all walks of life. She gives a woman's touch to an otherwise hard atmosphere -- especially noted in the front office by many of our customers. 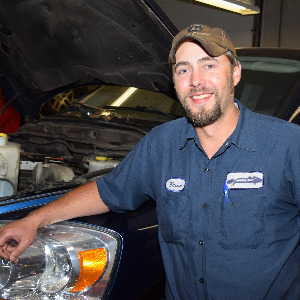 Brian started with Transolution Auto Care Center when he was in high school. He has climbed the ropes and knows the ins and outs of the bays from the bottom up. He excels in technical knowledge and management of other technicians. He wins the respect of all employees and customers. It is expected that one day he will become the shop owner when Chris and Peggy are ready to retire. Kody can be found doing all kinds of miscellaneous jobs around the shop. He is a sophomore at Sentinel High School. Kody is beginning an apprenticeship program. He aspires to follow in his uncle Brian's footsteps. Champ is a pure breed German Shepard, he doesn't leave Chris's side. Customers enjoy seeing such a beautiful dog when they come to the shop. Jared is a new team member to Transolution. Jared is a Montana Native from Hamilton Montana, and enjoys family and the out doors. Has been in the Auto industries for the last 4 years work at Nissan and Kia.